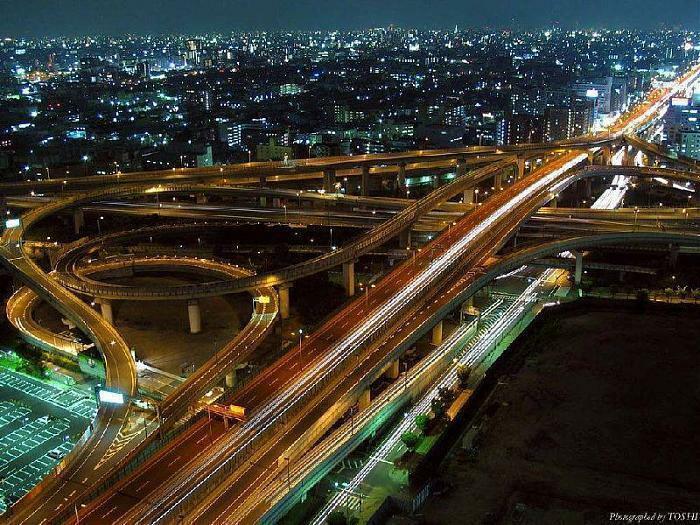 Can you guess where this flyover is situated? Kathipara Junction (Tamil: கத்திப்பாரா சந்திப்பு) is an important road junction in Chennai, India. It is located at Alandur, (St.Thomas Mount), south of Guindy, at the intersection of the Grand Southern Trunk Road (NH 45), Inner Ring Road, Anna Salai and the Mount-Poonamallee Road. 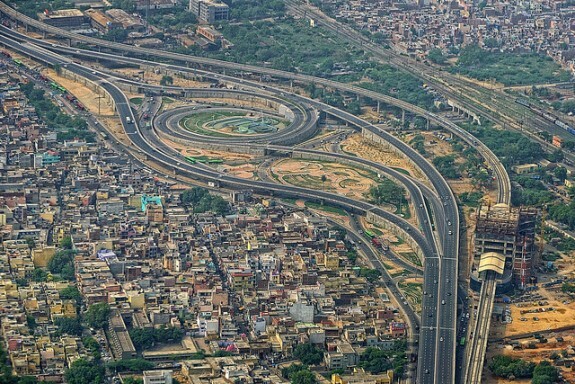 Kathipara flyover is the largest cloverleaf flyover in the whole of Asia. The junction used to be a roundabout and was the site of the statue of India's first prime minister Jawaharlal Nehru. A cloverleaf grade separator has been constructed as part of the NHDP to ease traffic congestion at the junction. The structure was built at an estimated project cost of INR 4,860 million with an initial deadline of March 2007. It is the first of three grade separators being built on the Inner Ring Road to improve connectivity between the various National Highways radiating from the city, the other two being the one on Koyambedu junction (NH 4) near the Chennai Mofussil Bus Terminus and the one at Padi junction. Originally scheduled for completion in March 2007, the main span of the flyover connecting Inner Ring Road and GST Road was opened to traffic on 9 April 2008 and was fully completed and opened to the public on 26 October 2008. The Flyover has been completed and was inaugurated by former Tamil Nadu Chief Minister Karunanidhi on 26 October 2008 at 21:00 hrs IST. It was then open to the public. The Kathipara Grade Separator is now a signal-free interchange that links IRR, Mount road, GST Road and Mount-Poonamallee Road and is expected to solve the problem of traffic snarls that is a common sight at this junction. This, being the first major interchange when coming from the Chennai International Airport towards the city, is expected to reduce the travel time to the city which is otherwise delayed during peak hours which causes snarls. As of today all the road works have been complete, but they are yet to take up the landscaping of the space in between the loops which includes development of park like features and fountains and relocating the Jawaharlal Nehru Statue to the center of one of the loops. The landscaping work is expected to start once the Chennai Metro Rail work is complete. It is a very beautiful flyover. I want to share one more flyover. it is in Badarpur border, New Delhi. Total length of 4.7 km. The construction of this flyover has helped commuters to a great extent by connecting all the roads , thereby reducing the number of traffic jams around the area. This area is generally crowded due to existance of numerous institutions and offices. It has double road and budget Rs 600-crore. Hebbal flyover is considered as one of the worst flyover in India-due to the fact that it has a signal on it, first of its kind in the world! A freeway junction or highway interchange (in the U.S.) or motorway junction (in the UK) is a type of road junction, linking one motorway to another; to other roads; or sometimes to just a motorway service station. On the UK motorway network, most (but not all) junctions with other roads are numbered sequentially. In the U.S., interchanges are either numbered according to cardinal interchange number, or by mileage (typically the latter in most states). A semi-directional ramp exits a road in a direction opposite from the desired direction of travel, but then turns toward the desired direction of travel. Many flyover ramps (as in a stack) are semi-directional. A U-turn ramp leaves the road in one driving direction, turns over or under it and rejoins in the opposite direction. The use of u-turn ramps is common in less wealthy countries. Off-ramp accessed from collector lanes along Highway 401 in Toronto, Ontario, Canada. Weaving is an undesirable situation in which traffic veering right and traffic veering left must cross paths within a limited distance, to merge with traffic on the through lane. The German Autobahn system splits Autobahn-to-Autobahn interchanges into two types: a four-way interchange, the Autobahnkreuz (AK), where 2 motorways cross, and a three-way interchange, the Autobahndreieck (AD) where two motorways merge. In North America, a flyover is a high-level overpass, built above main overpass lanes, or a bridge built over what had been an at-grade intersection. Traffic engineers usually refer to the latter as a grade separation. A flyover may also be an extra ramp added to an existing interchange, either replacing an existing cloverleaf loop (or being built in place of one) with a higher, faster ramp that bears left. Such a ramp may be built as a right or left exit. A cloverleaf or partial cloverleaf contains some 270 degree loops, which can slow traffic and can be difficult to construct with multiple lanes. Where all such turns are replaced with flyovers (perhaps with some underpasses) only 90 degree turns are needed, and there may be four or more distinct levels of traffic. Depending upon design, traffic may flow in all directions at or near open road speeds (when not congested). A stack interchange is a four-way interchange whereby left turns are handled by semi-directional flyover/under ramps. To go left (right in countries with left-hand drive), vehicles first turn slightly right (on a right-turn off-ramp) to exit, then complete the turn via a ramp which crosses both highways, eventually merging with the right-turn on-ramp traffic from the opposite quadrant of the interchange. A stack interchange, then, has two pairs of left-turning ramps, of which can be stacked in various configurations above or below the two interchanging highways. Stacks do not suffer from the problem of weaving but require massive construction work for their flyovers. A standard stack interchange includes roads on four levels. This is is significantly more expensive than other interchanges, and additionally may suffer from objections of local residents, because of their high visual impact. Large stacks with multiple levels are often colloquially described as Mixmasters or spaghetti bowls due to their complex appearance, being compared to boiled spaghetti. Los Angeles is the major city of California and is both flat and hilly. The highest point in the city is 5,080 ft.It is located in the northeastern end of the San Fernando Valley. Los Angeles is subject to earthquakes due to its location on the Pacific Ring of Fire. Flyovers in Los Angels are very helpful to reduce the surging traffic pressure on its boring road. Shanghai is the largest city of china and the world. It has a wide and heavy network of road transport which connects all the major cities with each other. It is located in eastern China. Shanghai has a rich collection of buildings and structures of various architectural styles. 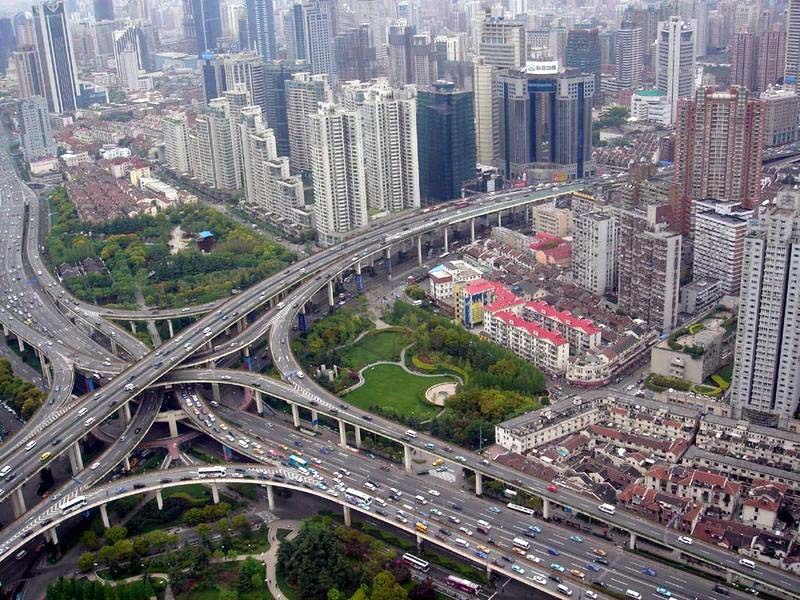 Shanghai has one of the best flyovers in puxi, Nanbei Elevated Road at Yanan Middle Road.